INTERESTING side dishes as well as accompaniments and salads can be made with rice. This versatile cereal can be used in almost everything from salads to puddings. With a sharp knife, slice off the tops of the four capsicums and scoop out the inside seeds. Place these in a pan of water and bring it to a boil. 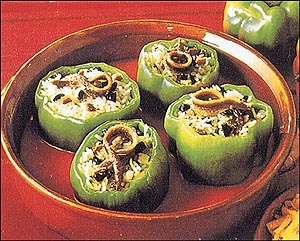 Drain out the water and then place the boiled capsicums in a baking dish. In a saucepan put the butter to heat and sauté the garlic, which has been peeled and crushed, as well as the mushrooms, which have been sliced in quarters and cook for a few minutes. Add the boiled rice to this and mix well. Season with salt and pepper to taste. Fill the capsicums with this mixture to the top. Mix the soup with half the water that the packet asks for and pour this into the baking dish with the peppers arranged in it. Cover the dish with silver foil and put it into the oven to bake for 15-20 minutes at a moderate temperature. Serve hot. Method: Put the boiled rice into a large bowl and season it well with salt and pepper. Peel the oranges and cut the flesh into large sized pieces. Add the oil to this and the garlic, which has been peeled and crushed. Season this with salt and black pepper as well and toss. Chop the salami into pieces and add it in the rice and toss it well. Cut up the cucumber with half a cucumber sliced into thin rounds and the rest of it chopped into small bits. Mix in the chopped cucumber with the rice and add in the orange mixture as well. Mix it well with a light hand. Put this into a serving bowl and arrange the remaining cucumber slices all around the sides of the bowl as a decoration. If you like you can also garnish with a few orange slices.